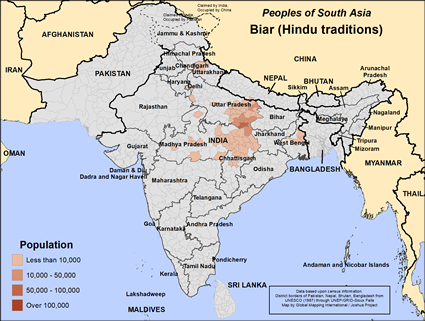 The Biar (or Bayar) community has two divisions, the Barhariya, who live north of the river Son, and the Dakkinahija, who live south of the river. These in turn are divided into several clans. Spouses are acquired through middlemen. Dowry, both in cash and kind, is given to the bridegroom's father. Vermilion is the symbol of a married woman. Mahadeva is the Biar's special deity. They worship Kali, Deeh and Aminal Devi as village deities. A Guru Bhagi performs the sacred duties of the community. Their major festivals are Ram Navami, Nag Panchami, Dussehra, Diwali, Til Sankranti and Holi. 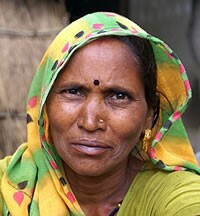 Uttar Pradesh, the primary home of the Biar people, has only a relative few Christian believers. Spiritual darkness is very deep. Perhaps Gospel radio in the languages of the Biar people will be widely available in the districts where the Biar live. We need to pray for the resources needed for this. Pray the Biar will be prepared for these broadcasts, to listen and understand. There may be a few secret believers among the Biar. If so, they need prayer. May the Holy Spirit be their teacher. Pray they will find each other for purposes of fellowship. Please pray the Biar community will hunger to know the one true God, their creator. Pray they won't be satisfied with anything less. View Biar (Hindu traditions) in all countries.